Complete your ensemble with a bit of color with a handmade 20 by 70 inch cotton scarf made in India by local artisans. Made of breathable cotton for all-weather wear. India has always been renowned for its rich silk fabrics, woodcarvings and carpets. However, many of these products are produced in conditions of abject poverty for the craftsmen, exploited by large producers and moneylenders. 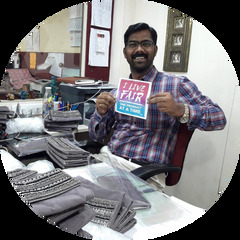 Asha Handicrafts is a not-for-profit making body, based in Mumbai, India, working to promote Fair Trade and Fair Trade practices. As a member organisation of theThe World Fair Trade Organization , Asha Handicrafts ensures that the benefits of handicraft production reach the craftspeople themselves.